Every year in the charming town of Montepulciano a strenuous uphill competition takes place: a race of barrels called Bravìo. Il Bravìo delle Botti is the challenge between eight districts: Cagnano, Collazzi, Le Coste, Gracciano, Poggiolo, San Donato, Talosa and Voltaia. The districts fight over a painted cloth (il panno), by rolling barrels that weight about 80 kg each along an uphill path of over a kilometer long. The barrels are pushed by two athletic “pushers”, through the picturesque streets of the historical city center, to the finish line on Piazza Grande. There is also a large costume historical procession and flag throwing show the day before the race. August 21 to 26 (except the 25th) – 9 pm | Nighttime test runs of the barrel pushers. Tastings and entertainment in all eight districts. August 25 – 9 pm | Costume Historical Parade through the streets of Montepulciano. Start Colonna del Marzocco towards Piazza Grande. At 10 pm flag throwing show on the square. 12 pm | Cathedral of Montepulciano – Offering of the candles to St. John the Beheaded, patron saint of the town. 3 pm | Historical procession, start Colonna del Marzocco towards Piazza Grande. 7 pm | The barrel race starts from Colonna del Marzocco towards Piazza Grande. 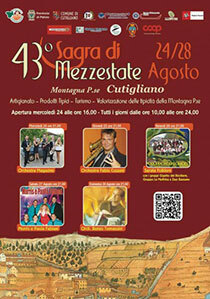 The Piazzale Sant’Antonio of the medieval town of Cutigliano hosts the 43rd edition of the 5-day Midsummer Festival. The main attraction of the festival is the market with typical products of the mountains of Pistoia. Besides good food, the festival offers music, folklore, literary cafes, children’s area and historical re-enactments in an indoor area of 700 square meters. Wednesday, August 24 open from 4 pm to midnight, the other days from 10 am to midnight. The September Fest in Carrara started back in 1976 as a celebration of the twinning between Ingolstadt and Carrara, and it quickly became the most important German-style beer festival outside Germany and attracts more than 120 thousand visitors every year. Its success derives from the Bavarian beer, music, shows and cuisine with a genuinely Bavarian atmosphere created by typically Bavarian structures. To fully enjoy the food, music, and events without the crowds, it is better to avoid Friday and Saturday evenings which are always very busy. The exhibition center is located at Viale G. Galilei, 133, close to the A12 Genova-Livorno, exit: Carrara. The charming town of Impruneta in the heart of the Chianti Region is the setting of a 10-day Music and Food Festival. Every evening starting at 7 pm you can enjoy the Beer Festival, music, food, and artisan market, a few kilometers from the center of Impruneta, on the vast grassland in front of the Stadio dei Pini, the sports facility Atletico Impruneta. At Impruneta GO! you’ll find the best Street Food with grilled meat, genuine Neapolitan pizza, tripe and lampredotto, fried dishes, vegetarian and vegan plates, ice cream, creperie and the best Napoletana pastry. A variety of artists and cover bands will take the stage every evening, including Killer Queen, 80 Voglia Ligabue Cover Band, Negramaro Tribute Band and local comedian and artist Lorenzo Baglioni. Full program available on the website of the event. 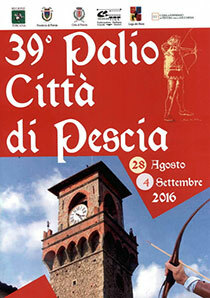 The Palio of Pescia is an archery competition between the four districts of the town Pescia. The event takes places in the historical center on Piazza Mazzini on the first Sunday of September. The side events at the Palio begin the Saturday before the competition, on Piazza del Grano with a street festival with jugglers, fire eaters, etc. In the morning on Piazza Mazzini, ancient siege machines will be on display together with the Combat Tournament with swords, and the tent camp of the District Casina Rossa from Montecatini Terme. Re-enactment of arts, ancient crafts and medieval market in Via Santa Maria and Via dell’Acqua. Full program available on the website of the event.